"Can a great story give a worthless item monetary value?" That's the question Slate Magazine is asking in a contest this week. Two authors, Joshua Glenn and Robert Walker, have written about people's prized possessions -- and naturally, the value we ascribe to our belongings often has little to do with their actual monetary value and more with the story behind them. To test this theory, the authors bought a bunch of items at thrift sales, and had some writers create fictional back-stories (which were passed off as true) about those objects, and then sold the items on eBay. Buyers paid substantially more for an object than the authors ever paid. 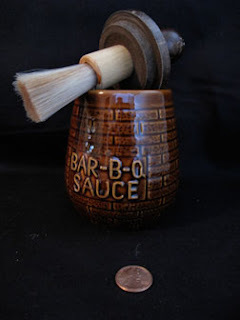 Now, the authors are soloiciting a back-story for yet another item, a little barbeque sauce jar and brush. Check the link above (on the word "contest") for more information, or to enter by the deadline of this Friday, October 16 at 5:00 pm. I'm inclined to think that the back-story is part of the value of objects of art, as well -- at least to viewers, if not necessarily on the art market. I recall seeing this one 1917 piece by Man Ray called "Boardwalk," in a Dada show at the Museum of Modern Art. The work was a sort of irregular checkerboard pattern made from the wood of a dresser-drawer, with several knobs attached and twine looped between them, and a piece of fabric pasted on. Make of it what you will. But what gives it an extra charge is that the piece was shown at a 1958 exhibition at a commercial art gallery in Paris, and some students, protesting the show being at a commercial gallery, took "Boardwalk" off the wall, ran outside with it, and shot it several times with a small gun. Man Ray himself was amused, and felt the piece gained some street cred. The piece may or may not now be a better work of art for having been shot, but its history --- it even has the scars to prove it! -- imbue it with intrigue, and perhaps even more monetary value.